The carcharodontosaurid Concavenator is known from an almost complete specimen from Las Hoyas in Spain. 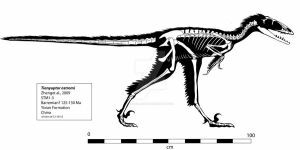 This skeletal restoration is based on photos and tracings of the specimen with corrections for bone distortion, rotation, and displacement. It's the first skeletal reconstruction I've done entirely in the computer (no pencils, pens, or paper) and it went quickly and I believe, more accurately than any previous restoration I've done thanks to the ability to directly trace over individual bones and maintain correct proportions. Not having seen the specimen, I'm unsure about some details, especially the vertebral spines above the pelvis. It looks like they should continue across the pelvis, making a gentle arch, rather than the wierd, double hump, but that remains for someone with access to the specimen to determine. The quills along the ulna are based on the apparent presence of quill nodes on the specimen and the scale bar is 100 cm, divided into 10 cm intervals. I agree with you on the vertebral spines above the pelvis, it would seem like there should be something there. Can I use this skeletal as an anatomical reference? Yours is the best Concavenator rendition around. Please go right ahead. Thanks! Very nice work! Did you do this in inkscape? 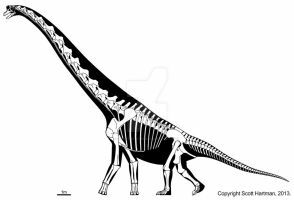 I think the awkward spines may have been connected to those of the tail at least by a muscular hump or ridge, even if there were no spinous processes reaching above the ilium. 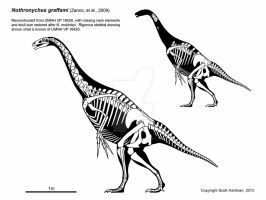 That may have had some use in aiding the pulling motion executed by the M. caudofemoralis lungus (when it retracted the femur against the hemal processes) in flexing the tail base slightly upwards (giving a better leverage and additional power to the ventral musle). Or perhaps even leg muscles attached there directly (tough that seems less likely). Hey thanks. I used Adobe Illustrator. I agree the spines look like they support some big ligament or muscle structure. I'd be interested to see what a detailed anatomical study would come up with. Extraordinary. It looks as if it's designed to be ridden! Heh. Hadn't thought of it that way, but you're right! nice! even the skeleton incomplete.. Thank you. I try to be as accurate as possible. 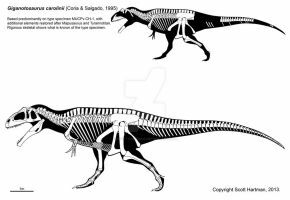 Is this animal different in basic proportions compare to larger carcharodontosarids like Acrocanthosaurus or Mapusaurus? 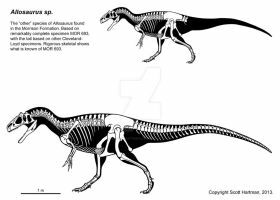 I want to do some reconstructions myself, so I wonder if i could use Concavenator as a good model for tail length. Good question! 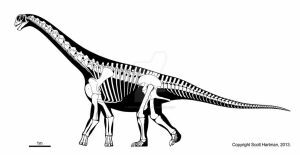 Concavenator is a LOT smaller than either Acrocanthosaurus or Mapusaurus, so it's proportions might be different. 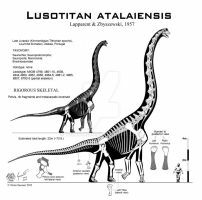 It's tail seems to be not as tall towards the rear as Giganotosaurus or Acrocanthosaurus, but the length relative to the animal seems about the same. 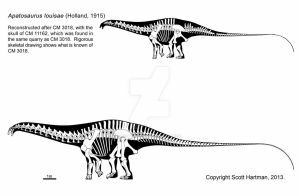 Do you know where I can find a copy of Coria and Salgado's paper describing the Giga holotype? You should be able to get it through interlibrary loan since it's in Nature. Or you could email Rodolfo Correa and see if he's got the PDF available. The paper is very preliminary and doesn't illustrate the specimens well at all. I found a picture of the pectoral girdle. The coracoid is very small proportionally. Does that only occur in Giganotosaurus? Mapusaurus's scapula seems longer and more slender, and the coracoid is not articulated so I can not tell. Excellent question. 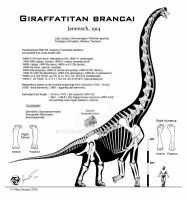 I haven't looked at the pectoral girdle of Mapusaurus, but Giganototsaurus does have reduced coracoids and a very reduced scapula for it's size. Biomechanically that means smaller muscles too, but why, I have no idea. Ah I see. Maybe I will start on Mapusaurus first. so, thats what the spines look like? This is indeed a very strange specimen. Is this a real thing? It's hard to tell. It's very real. 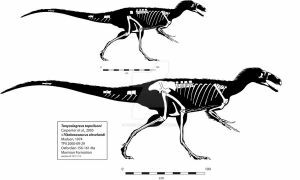 If you google Comcavenator, you can find the original paper and photos of the specimen. Thanks very much. It's always fun to see how a skeleton is going to turn out during restoration.